What's New in URI Chinese? : 2/26: U.S. Intelligence Community (IC) Virtual Career Fair - Space is Limited; Register Today! 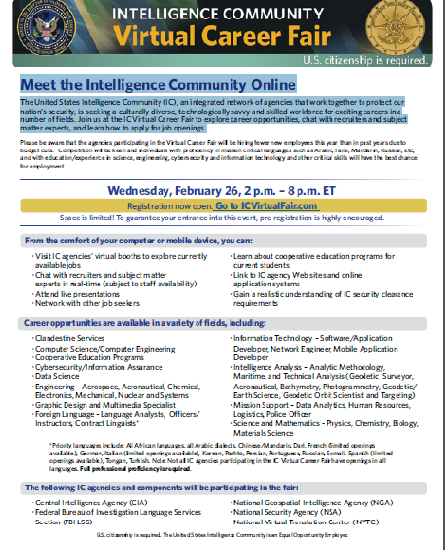 2/26: U.S. Intelligence Community (IC) Virtual Career Fair - Space is Limited; Register Today! The United States Intelligence Community (IC), an integrated network of agencies that work together to protect our nation’s security, is seeking a culturally diverse, technologically savvy and skilled workforce for exciting careers in a number of fields. Join us at the IC Virtual Career Fair to explore career opportunities, chat with recruiters and subject matter experts, and learn how to apply for job openings. Please be aware that the agencies participating in the Virtual Career Fair will be hiring fewer new employees this year than in past years due to budget cuts. Competition will be keen and individuals with proficiency in mission critical languages such as Arabic, Farsi, Mandarin, Russian, etc, and with education/experience in science, engineering, cybersecurity and information technology and other critical skills will have the best chance for employment. Space is limited! To guarantee your entrance into this event, pre-registration is highly encouraged.